In contrary to a pitched roof, a flat roof is mainly just that: Flat. By its definition, flat roofs are complex and tricky. A flat roof has a very slight slope, which will permit water to trench gradually from its surface area. Flat roofs are prone to leakage due to its flat structure or shape that is why you need Orezona Building & Roofing to install your flat roofing system correctly. The flat roof structure is the most cost effective roof installed nowadays, both for commercial and residential roofing. This shape permits for walk decks to be combined, very easy access, and easy set up of solar panels. A flat roof also needs less mounting materials in building houses, but it also lacks a loft space. The flat roof in warm climates reflects and provides energy efficient roof system. Rubber Roofs- Exceptionally durable surfaces, which can stand severe weather, temperature variations, fire, and leaks. Rubber roofs can cover the whole roof it also comes in a rubber shingle form. Rubber roofing is particularly environmentally friendly because it is manufactured from used tires, saw-dust, and slate particles. Rubber roof tiles are extremely resilient to cracks, fades, and crumbles during severe weather conditions. 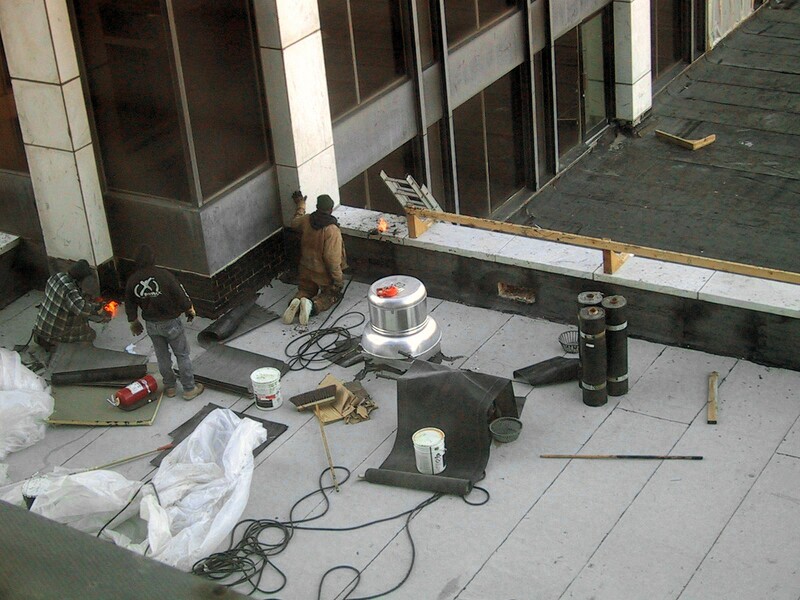 Asphalt Build – is the most common type of all flat roof systems. The tar and gravel are commonly used in this kind of flat roof. This type of roof will not hold up very well to the weather elements. It often shows wearing away after a very short period. It will become dry and brittle due to sun exposure and will show indications of cracks quickly. When the asphalt roof begins to crack and weather, it is instantly susceptible to leaking. The life’s duration of the asphalt roof probably eight to ten years before a new roof is needed. Turbo Seal – Forty-five percent of the material is made of recycled rubber tires. It will be applied on the top of tar roofs as a gel and will settle but not ever hardens. A protective sheath is then used to form a waterproof seal. Silicone Coating – Silicone coatings are water resistant and respond very well in sun exposure. The UV protection will be helpful during summer months, and will decrease the likelihood of recurring roof repairs. Hot summer sun can damage the roof most, not snow or tree branches. It is water resistant. When the water is collected on your roof area, it will not find any ridges to sneak through because the silicone fully prevents this. EPDM- Ethylene Propylene Diene Monomer. It is the newest, utmost, most effective tool in today’s flat roofing. This composite is vastly resistant to UV rays and heat, weather and waterproof, and tremendously adaptable to cold climate changes. EPDM is very long-lasting and is being projected to last forty years and beyond, making it an ideal option for roof replacement and installation projects. EPDM will not fall apart with the varying weather; it will withstand hail storm and does go brittle with sun exposure. You have a wide array of choices what type of flat roof you like. Orezona Building & Roofing will assist you and will only install the best. They offer exceptional challenges for flat roof solutions and other roofing services, as reflected on customer reviews. They are dedicated to installing only the greatest quality products and committed to getting the work done correctly because they are the best place in roofing in Corvallis OR. You may call us at (541) 204-1286 or visit us at our Orezona Building & Roofing Facebook Page for more details. Contact Us Today!